In my quest to reduce gluten intake and satisfy my occasional cravings for cake, I've taken to baking. I am still awful at it. The latest disaster being a "too bitter, too dense" version of the Healthy Chef, Teresa Cutter's Naked Chocolate Cake. The issue isn't her recipe, just my "creativity" and throwing in too many "ideas" of my own. (Hey, why do you think I hack IKEA?) I've had great success with her Banana + Coconut Bread though, which is delicious to the power of 3. However, as in most things, there is a silver lining. The Avocado Mousse, made to top the cake. It made my ruined cake almost edible. Trust me. It's the bomb! I wondered how I lived so long without tasting this Avocado Mousse Supremo. This is my first time but I promise you this, it won't be the last. A quick google later, I found the Avocado Mousse touted as a healthy alternative to icing, a gluten-free fan favourite. I also discovered that most people just ate it as well, mousse. That can't be! I made up my mind that this yummy thing should have more application than one. For the next few days, I raked my baking-noob brains for other ways to savour every last dollop of the fluffy, creamy, melt-in-your-mouth goodness. 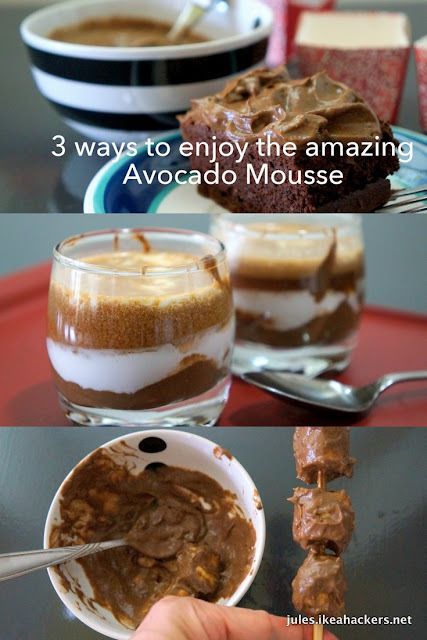 So I humbly present to you my experiments on the Avocado Mousse. A modified recipe of Teresa Cutter's Avocado Mousse (Serves 10) Thanks, Teresa! Teresa suggests a high-speed blender. I don't have one, so I used my regular Philips blender . First I poured in the liquid Stevia, then I added the avocados, vanilla and melted chocolate. Blend for about 30 seconds until smooth and creamy. You will need to scrape the mousse off the sides of the blender to mix well. Add a splash of water or coconut milk to achieve the consistency you want. Taste and adjust sweetness as needed. Spoon into a bowl and allow to set in the fridge. Now that you've got the mousse, it's time for some fun! This needs no explanation. Make a better version of the cake than I did and slather the mousse all over it. Dig in. This was inspired by the cute Tokyo Banana I saw on my trip to Japan. But instead of a banana-shaped-sponge-cake, I thought the mousse may go well with the real deal. At first I wanted to coat a whole banana on a stick but it kept slipping off the skewer. Dang! If you manage to, let me know. In a bowl, mix the Avocado Mousse with bite-sized banana cuts. Then, it gets a little messy. When bananas are coated, poke them through skewer sticks. On hindsight, one bite-sized banana on a toothpick may be more fun to serve and eat. Place the coated banana skewers on a tray and leave them in the freezer for 2 hours. Don't leave them for too long as they will be become impossible to bite into, unless you have jaws (and teeth) of steel. After 2 hours, they are ready. Cold and crunchy. Sweet and chocolatey. A summer treat. They should be eaten promptly. If left out in the heat for too long, you get soggy avocado-bananas, which won't fly. Of the 3, this is my fav! The bitter coffee blends beautifully with the sweet mousse. The creamy coconut seals the deal. It's also beautiful to behold. In a shot glass (or small jars, if you wish to keep them for later), gently layer in the ingredients. Using a teaspoon, scoop in a dollop of mousse. Keep adding until the base is covered. Then slowly pour in coconut cream . Stop when it reaches the midway mark of the shot glass. Lastly pour in the coffee. Leave it to set in the refrigerator. You should try replacing the avocados - which impart a strong flavor - with bananas instead. Because I find the bananas are slightly more watery than avocados, I suggest you decrease the amount of syrup by a third to compensate. You get a delicious mousse and none of the weird lingering avocado after taste.